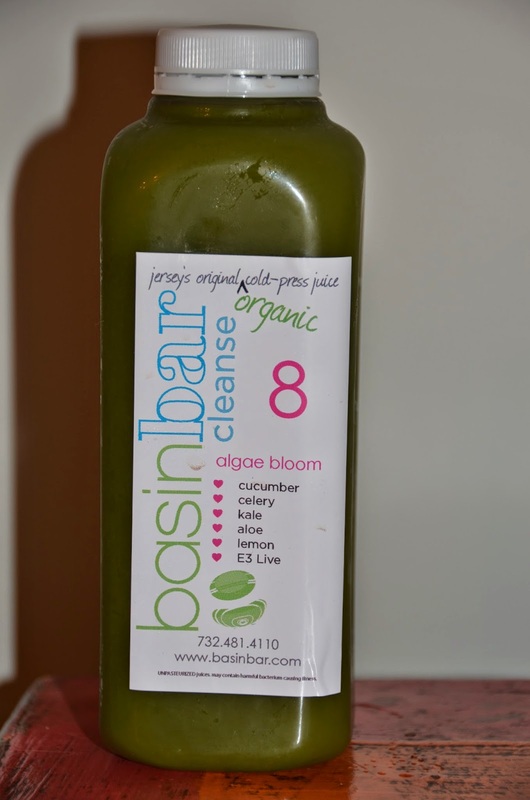 A few weeks ago, Rich and I stumbled upon Basin Bar in Asbury Park, New Jersey. 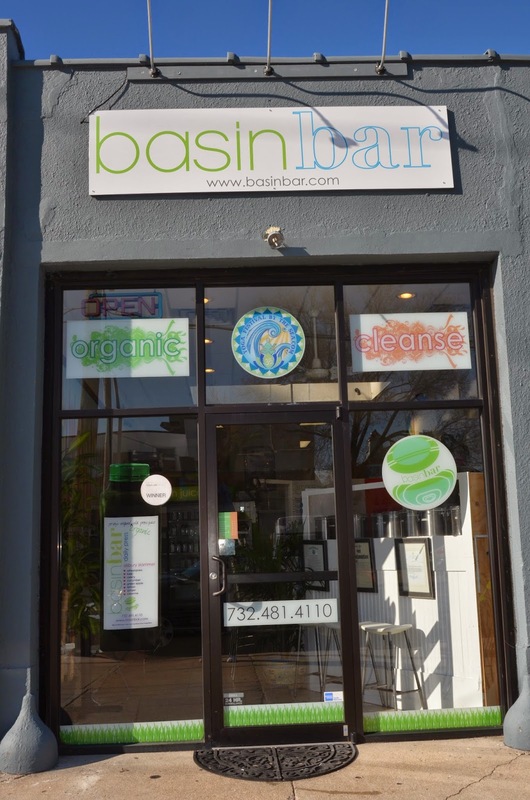 It's a juice bar that specializes in organic juices which are made on site. 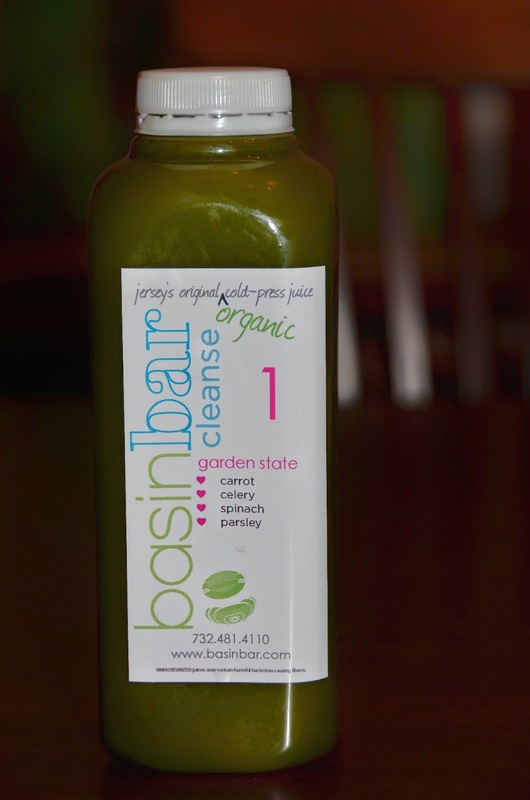 They also supply juices to local restaurants and offer different juice cleanses. This was one of my favorites! The juice really did taste mostly like celery which might sound disgusting, but it was pretty tasty. It was refreshing, and gave me a much needed boost first thing in the morning! Rich thought it was okay. This also was another favorite- I really do like green juices and this one was sweet and tasted mostly like an apple smoothie. Rich and I were both able to drink Juice #1 and Juice #2 pretty much without a problem. This one was a dreaded one for both me and Rich! Every time we would get to this one, we pretty much wouldn't be able to swallow it without forcing ourselves to. It tasted mostly of carrot and sweet potato, and while I love them hot out of the oven with butter, drinking them is just gross. This one was pretty decent. For the most part, I think it tastes like unsweetened grapefruit juice. I thought this one was good at cleansing your palette after all of the greens. I didn't really taste the cayenne, but Rich did and he didn't love this one too much. This drink was marked "HOT" because of the cayenne and it was! 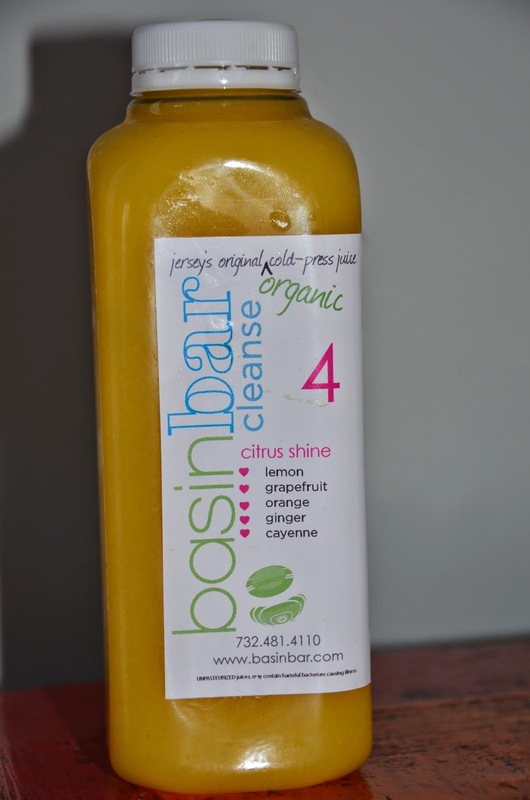 Citrus Shine also has cayenne, but I think this one has a lot more- it would burn the back of your throat when you swallowed, and your lips would even tingle a bit too. This one has a lot of ingredients, and to us, ingredients that would be better cooked in a dish versus drinking them. It tastes mostly like beets, and it was so hard for Rich and me to get through this one. Never once in the three days did either one of us completely finish an 8oz bottle of this...it was too much to do! I loved this one, and could probably continue drinking this one every single day going forward! 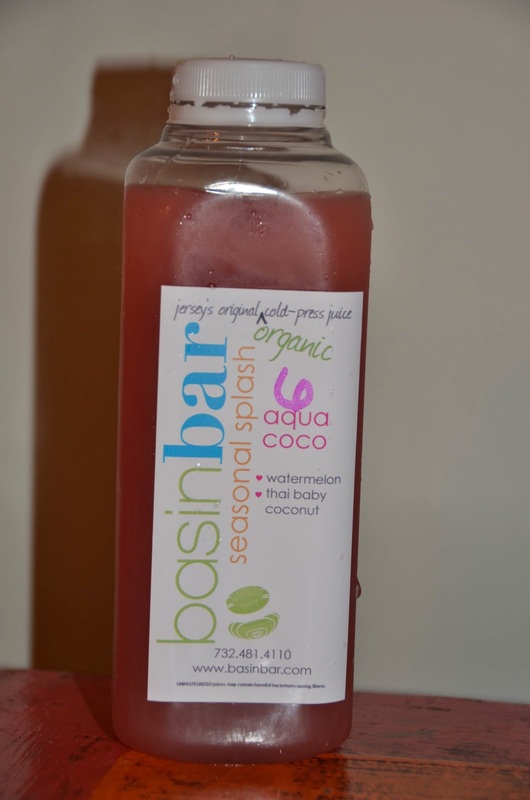 It tastes mostly like coconut water, but with a very mild flavor. The hint of watermelon added a nice taste too and gives it a really appealing color. Rich also liked this one, but said it would probably be better served over ice on a really hot day- he never finished one 8oz bottle of this one either, while I could have probably drank mine and his daily! Again...ingredients better suited for a pasta dish than to drink! I could barely get this one down, and never got close to even finishing half of one (same for Rich). Basin Bar recommended that we pour this one into a bowl and eat it like you would a gazpacho soup. We tried that...still didn't help! This green juice was so thick and hard to swallow- just talking about it is making me nauseous! This one was pretty good. It was refreshing like the Citrus Shine, and had an overall mild cucumber flavor. 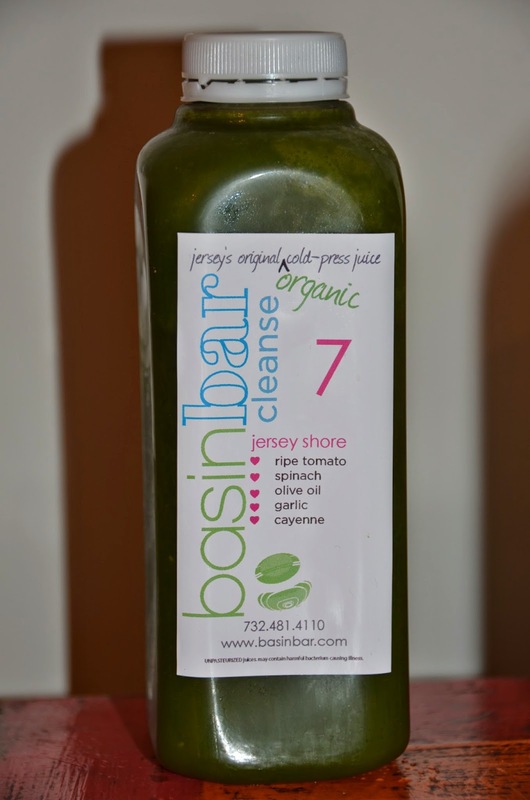 However, I don't know if it was maybe because it was the last juice of the day and just hard to swallow another one at that point or what, but we never finished this one on any day of the cleanse either. 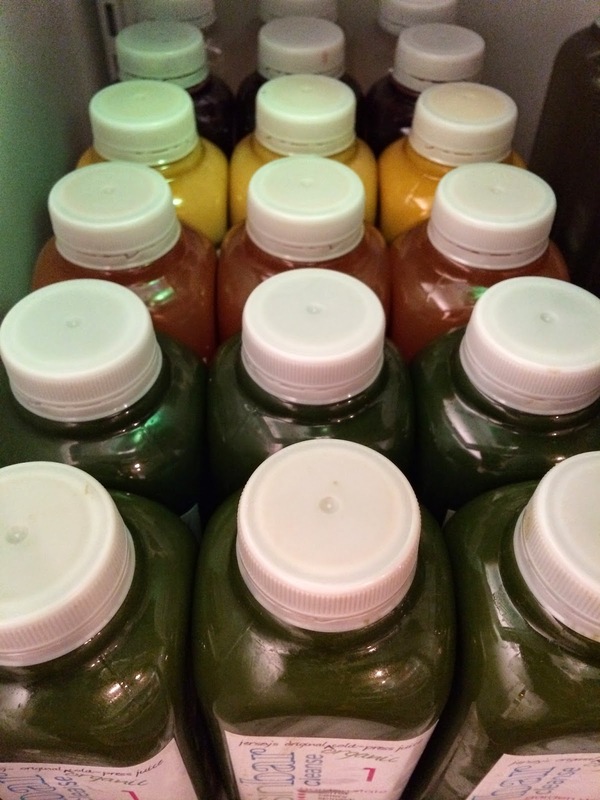 Day Before Cleanse: A 3-day juice cleanse really starts the day before. The reasons for this are (1) you are told not to eat meat because it's hard to digest, and (2) to start cutting down on the caffeine since you won't be able to have it during the cleanse. 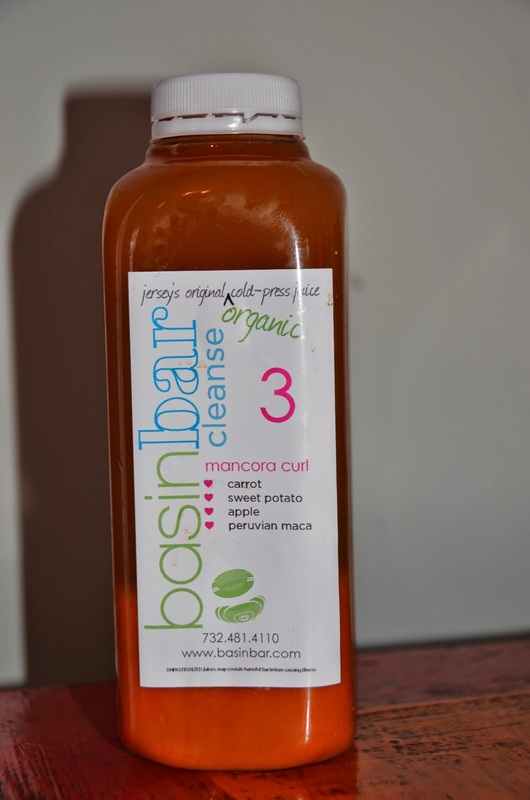 You can either have Basin Bar ship your juice to you or pick it up. Rich picked up our juice, we cleaned out our fridge of extra food we wouldn't need, and this is what our refrigerator looked like...48 bottles of 8oz juices to get through over 3 days!!! Day 1: Day one was probably the easiest, and usually for most people they say that it is! That's because it's new, it's fun, and you get to try each juice for the first time and it's exciting to see if you can make it. 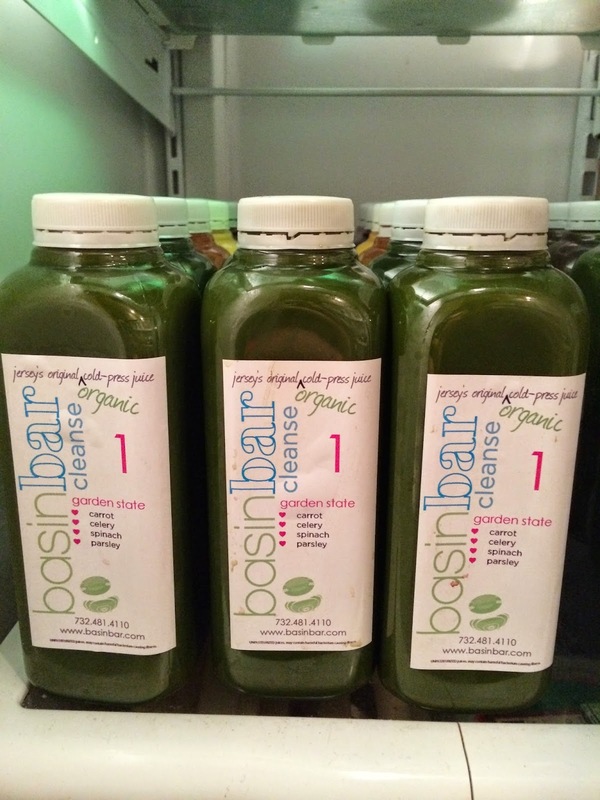 I started out with the two first green juices right away and was starving, so I opened the third by about 9am. (I was up since 5am going to the gym and being up with the boys). By the third juice, I felt weak and I broke down and had a cup of coffee (usually I have two). I got through the rest of the juices, but remained so hungry all day. Rich got through 1-5 and a few sips of 6. He got home and was exhausted and went straight to bed at 8:30pm and never tried juice 7 or 8. Who am I kidding? I went right to bed with him! The gym, the juice cleanse, the lack of food...it was already taking its course on day 1! Day 2: Day two is said to be the hardest, and it was! That morning we both got on the scale and Rich lost 3 pounds!!! I, unfortunately, didn't lose one! What is it with guys metabolisms?!? Not fair!!! Anyway, we discussed how we were going to get through the day, and Rich came up with the great idea to only drink half of each juice. I had already finished 1 and 2 when he said this, but I thought it was fantastic because my next juice was #3 (not a fan favorite). It was so much easier going through the day knowing we only had to drink half. I was still hungry, but surprisingly not as hungry as I was the day before when I was drinking the entire 8oz bottle for some reason! I also broke down and had one cup of coffee. We both got through the juices, but both went to bed at 8pm that night! I was starting to think at that point, was this worth it? I hadn't lost weight, I was going through the day hungry, and I was super tired and not energized!?! Day 3: We both got on the scale that morning and I lost 3 pounds and Rich had lost 4 pounds! I was so motivated then!!! We both did exactly what we did the day before, drinking only half of each juice. I also had a cup of coffee in the morning. I drank all of #1, #2, and #6 again because I really liked them all. On this day, it was already 2pm and I had only drank 1-3. Rich got through half of all his juices, and I never even got to 7 or 8. I went to bed at 8pm again, and Rich stayed up until 10pm. 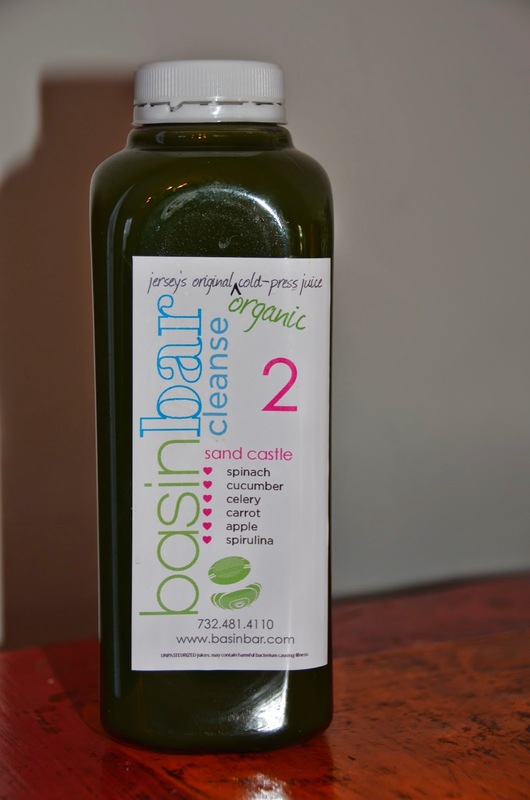 Day After Cleanse: We had talked about this day all during the cleanse...what we would eat to break our cleanse. We both got on the scale, and I had lost 5 pounds and Rich stayed at losing 4 pounds! We decided the first thing we wanted were bacon, egg, and cheese sandwiches and jelly donuts from a restaurant that rocks at making both of them! (Don't judge- most people probably break a 3-day juice cleanse by eating salads, but we wanted to go all out!) Well, after we ate the "break-our-fast" meal, I now see why most people probably eat salad first...I got so sick!!! I could barely get through the sandwich, and I couldn't even touch the donut. I spent the day in the bathroom and in bed recovering. By night time I felt better and was able to eat a nice home cooked meal, and the next day was Easter, and we both ate fine...candies, chocolate and all! Bottom Line: It was an expensive thing to do, but in the end we saw results, not only on the scale, but also with our bodies. Everything for the next couple of days tasted sweeter and more processed than before. For the most part we do eat healthy in our home. I cook nice balanced meals every night for our family, we are part of a CSA in the summer, and for the most part we buy only organic fruit, vegetables, and meat. It was a great way to "jump start" our health and wellness regiment before the summer starts, and since the cleanse we continue to eat well and go to the gym. 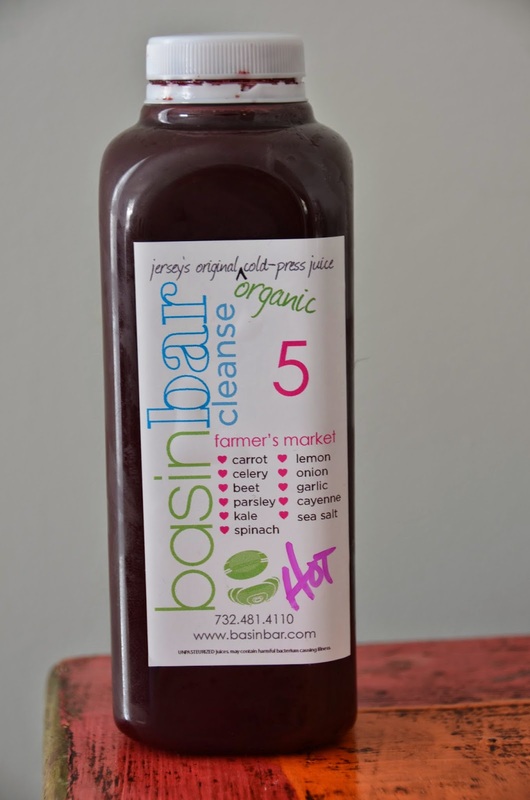 We are glad we did it and may do it again down the road, but next time try a Juice-til-Night cleanse where you only drink 4 juices and then eat a balanced meal at night.